← How big is this fire? “Experiment” is not something you want to hear when building your house. I’m not sure what I thought when the architect told me he would like to “experiment” with the exterior siding material. But what he proposed was compelling enough to give it a shot. The exterior siding will be shou-sugi-ban (焼杉板), or burnt sugi boards. Sugi is known as Japanese Cedar, but its really a cypress not a cedar. Instead of sugi, our sidings are western cedar. Traditional Japanese homes commonly used shousugi-ban for their external siding, although rarely used now (replaced by plastic looking siding that’s highly fire resistant). The sugi was burnt to resist rot and fire. Supposedly its harder for something already charcoaled to catch fire again. Finally, the boards are oiled with oil extracted from Brazillian oiticica nut (Penofin) that acts as a sealant. Because the oil is natural, it won’t generated any toxic vapors. The result is a board that has a dynamic appearance. From different angles the board can look black, silver, or dark brown. Like all natural wood siding materials, the siding needs to be oiled every year, spray the oil onto the siding and wipe down. I’ve always like the look of burnt sugi used in traditional homes in Japan. You would think that a house with black siding or a black interior would be ominous or depressing. But instead these traditional homes convey refinement and are relaxing to be in. Hopefully our house will achieve the same – but because its an “experiment” the outcome is not ensured. This entry was posted in architect, construction, house makeover, Japan. Bookmark the permalink. Very interesting post. Thank you. I’m an architect building my own house in Scotland (with my japanese wife) and was sent a link to your blog. I posted a link about the shou-sugi-ban technique and copied a few images, hope this is okay with you. Congratulations on a very beautiful house and a great blog. In Matsushima I’d recommend a boat trip of course, but there is one that goes from Oku Matsushima which has a beach too if it’s hot – get the train to Nobiru – 3 stops further away from Sendai. In Matsushima town there is a fantastic Tempura shop – its a hike from the main tourist area but worth it. They have a famous ten-don which is HUGE. Hire a bike, on a small street on the left after you get out of Matsushima Kaigan station and explore. The temple in Matsushima, Zuiganji, is brilliant, one the best I’ve visited in Japan. It even has nightingale floors. We are so jealous! Have fun and thanks. I’m in the process of designing a home and our architect pointed out this process to us. I hope you’ll post more on your progress as I’m very interested to know how it turns out. We are building a house in the UK using this type of cladding inspired by your website. Do you have any more technical information on how much the boards were burnt – what depth of burning was necessary to get the finish you needed? I don’t have technical detail but the surface was burnt till there was charcoal. You may want to experiment since it could be different based on the type and quality of the wood. There is another technique documented at Dwell (http://www.dwell.com/articles/Terunobu-Fujimori-Profile.html) and view the slide show. We used this technique on our charcoal home in Blithering and achieved a lovely hyggelig Hue. I am particularly interested in how this process weathers over time. I understand the theory of it is that it wears well, but I’d like to hear some real accounts of how it holds up after years of weathering and re-oiling. It looks great. I am wondering what kind of life span can you expect from it? Does the burning have any impact on the life span? i found your link via Remodelista. Thanks for the process description. One question — why scrape and wash the charred material off? In my guess the purpose for charring a certain depth of the wood is because that charcoal protects from further burning. By scraping it off you remove the protective layer. My assumption was that the “Shou-sugi-ban” theory is the same as in some building codes – where with buildings that must be of “noncombustible construction” (ie steel and other fire-rated materials), the use of “heavy timber” is permitted in some cases, because it is thick enough to develop the thickness of charcoal required to stop burning further, allowing for safe escape before structural failure. At least for us, it was aesthetics. For example, http://www.dwell.com/articles/Terunobu-Fujimori-Profile.html doesn’t scrape if off. Thanks, the appearance of your siding is indeed beautiful. How has it been performing? The shou-sugi-ban is a beautiful technique. Congratulations on a fantastic remodel. I was wondering if you could tell me where you learned about the process – how the burning prevents fire and preserves the wood? Is there a resource where I can find more info? Hi, & congratulations on this inspiring project. I write from London uk where I’ve just sourced some cryptomeria, and am heading down the same route on small section vertical cladding on a 4 meter cube studio building. When you oiled with Penofin verde, which colour did you use? – Is ‘natural’ clear? I see they have an ebony, but this would be to paint coal black! I’m wondering if Osmo uv block would be a viable alternative, as Penofin seems impossible to source over here? We used the ebony. Not familiar with Osmo, but try a small test sample. We are currently doing a project in Los Angeles with the burnt wood application on a Live Edge Tight Knot Cedar. I am having trouble finding a contractor that will do this. Who did you use to do this application. It is truly gorgeous and would like to contact them. i too am doing a project in LA with same materials, using it for siding, and not live edge, did you find a contact for burning? i have a mill for the material and a guy with a crew in oregon who can come here, maybe we do this together? Try http://hunterleggitt.com, he’s up in LA now. My studio, clad in vertical spaced small section (50 – 80 x 25 mm) Sugi was opened for London Open House last weekend. You, or anyone else interested, would be welcome to visit, and I can show you the techniques involved. We used Cryptomeria Japonica, which we found by chance, UK grown, in Wales. This was delivered sawn, but we ended up planing 1 mm off the sawn face to stop the saw pattern showing through the burn. Finding Cryptomeria was lucky. It burns and patterns very readily, which is not the case with Western Red Cedar, or Douglas Fir. These have their own character, as does oak, when charred. Nor would I vouch for their inherent preservative properties, burnt. This process is not like thermowood. There are a number of contemporary technical articles on the web regarding the seasoning of Sugi. Ie I think that the information is out there, if someone can pull it together. OSMO UK sponsored protective coatings for both interior and exterior woodwork, Uviwax and UV Protection Oil respectively. The Uviwax is going on birch ply, which is a stringent test of its capabilities to withstand the yellowing to which birch is prone, and I have been advised by others who have been down this route to lay on a very light white foundation in advance. I’m tempted to spray this to avoid the local build-up that can occur with hand application over larger (4 x 4 meter) areas. As with the Birch, I am going to let the exterior (burnt, scrubbed and washed ) sugi equilibriate – weather – a while before I take the decision on applying exterior finishes. In Japan, traditional sho sugi ban is a lighter colour than that currently in favour here – see the Fujimori Tree House at the recent V&A exhibition: Architects Build Small Spaces, and http://www.bdonline.co.uk/buildings/…/charred…london’s…/3091943.article – Cached . Both are heavily burnt, a kind of timber equivalent to raku, but will be very fragile. The surface I have has a lot of tonal variation, board by board, produced by the cut and the burn, and it would seem a pity to denude this by staining it uniformly. My friends in Kyoto, where there is a lot of this stuff, were adamant: No oils. The process of producing sho sugi ban is its protective coating. As you scrub and wash the burnt timber surface, you will notice that the charcoal slurry is waxy to the feel. With due respect to all the excellence above, I’m following their advice and leaving it alone for the time being. If the surface starts to weather “badly” I’ll conduct the OSMO UV Protection Oil experiment next Spring. Because of the dimension of my timber, particularly its thickness, and the fact that it has been pannelised and is easily demounted for maintenance , I would also have the opportunity to re-burn, if necessary. This might not be possible with the more traditionally thinner but wider section boards. You can contact me via them. Finally I’d like to re-iterate my thanks for the inspiration and the generosity of those posting this site. It takes a lot of effort, and a laudable sense of responsibility to put out information in this way. We are all experimenting, stumbling along an ancient track in darkness, lighting each others ways. I am Brynja, a interior designer from Iceland. I ran into you on this blog on search for instruction on the shou sugi ban technique. I would greatly appreciate it if you could spare the time to answer some of my questions and advise me on the subject. I am very interested in making some experiments with the shou sugi ban technique in a bathroom. I have only seen it on photos and it looks very beautiful and I image it as very lively and cozy . I m just wandering about the finishing. If I leave it untreated like some do for outdoor use it will probably give color. I am also concerned about the smell. Would it be good to put a varnish on it to close the smell. I am also thinking of putting a shower with transparent glass walls on all sides so that the wall will be seen despite of the shower. With that I am a bit concerned about the aging of the wood. It won’t age in the same way as the walls around it. How does a wood age that does not have any access to oxygen? It just has the smell of cedar. Our interior siding hasn’t shown any aging – but over time I’m sure it will look different – but that’s part of the appeal of natural materials. I’m not sure how it would hold up in the bathroom where you have a lot of moisture. I think the key to success is going to be a little experimentation with whatever species you are using, and its finish. I have douglas fir in my bathroom, which has been treated with 2 coats of Osmo Polyx oil (3032 clear satin). This has stood up well for 4 years, but areas subject to surface water around the bath now need recoating. Re sugi, the crucial part of the process will be washing the burnt wood. Hose and scrub it well with a stiff broom, hose it down again. then let it dry. Then I’d repeat the washing process again. Scrubbing the charcoal surface changes the colour, so don’t expect it to stay deep black. Now decide whether or not to seal it. I expect you will need to. The scrubbed and burnt surface of sugi is slightly oily and will continue to rub off for some time unless sealed. Cedar is often used specifically for its smell. Cryptomeria Japonica, the wood traditionally used for sugi is not in fact a cedar, so you wont be losing character on this front if you seal it. Also, your finish will remain homogenous. I see most have only used this practice for siding. Has anyone tried this for flooring and would you oil finish it for a floor? Love the burnt wood…. would make lovely flooring. What a joke. Plenty of natural products are toxic. Castor oil is completely natural and is deadly. The notion that something is harmless as long as it is “natural” is preposterous. Yes, Adder venom is poisonous. As a child I was subject to doses of both. I can’t now recall which was worse. The underlying point being made is about concentrations. We leave masses of concentrated chemical products which do not naturally occur, or in places they do not naturally occur. This causes problems, whether or not they are natural or synthetic in origin. My (unstained) sugi has weathered over the winter to a mid tone with a lot of variation. No longer the lustre of a new pair of shoes, it looks like its been there for 50 years. I quite like this. I sell wood siding in North Carolina. I have sold Western Red Cedar, Inland Red Cedar, Incense Cedar, Cypress, Atlantic White Cedar, White Pine, and Southern Yellow Pine. I ALWAYS recommend prefinishing the siding and the finish applied will, of course, determine the finished look and the longevity of the protection. “Clear” finishes without UV inhibitors will require power washing or cleaning and reapplication almost yearly to maintain the original wood color. While I am not a wood specialist I can see that the burning process significantly changes the outer layer of cells and probably renders them more resistant to insect damage. I do know that the oils in cedars and cypresses help resist insect damage and prolong the life of the board or beam. Finally, paints or stains are for protection first and beautification second. Take your time, do your homework, explore all options, and remember that there is no substitute for quality. Pingback: Private Residence LWH « « Architrix Design Studio Inc.Architrix Design Studio Inc.
Can the technique be applied to treated pine? The answer is to experiment. I demonstrated the Cryptomeria process to Barry Yarde at Axion (London). He then tried it on Douglas Fir as a test for its viability in the interior of a major Railway Station refurbishment. In the end it didn’t get used, but the process worked fine. The surface of Cryptomeria burns very easily, that’s why its used in this way. Burning in the traditional manner helps preserve it, it also provides an economical means of achieving a durable, handleable, exterior finish to the sawn surface of a fairly soft stock. Douglas will burn, but less easily. Oak will burn. So will pine. You might wish to treat the knotts individually. I use a small plumbers blowlamp. Any scorched timber left untreated as an exterior surface will weather, more or less rapidly, to grey. And it will be affected by the way rain water runs over or off it. If you want to preserve the initial result of burning and scrubbing the surface – and its the scrubbing that controls the finish – you will have to treat the timber to hold its characteristics, as did the sponsors of this site. So experiment! And when you are reasonably sure that you have developed a reliable standard process – so that you might in future be able to replicate, renovate or repair – compare this to a simply stained down sample of the same timber so that you can see the difference. If you prefer burnt product, and it makes sense to use it instead of say stained thermowood, then welcome to our merry band. What is the texture like? I’m thinking about making a table and finishing the wood like this, but I’m not sure if the char rubs off, or if it’s too oily (on that subject, how much oil was applied?). I’d also like to know if the wood is strong after the process, or if it splinters or chips easily. Basically, would you use a table made from those boards? Cryptomeria Japonica, the timber species of traditional Sugi, has a naturally oily finish when burnt. This is one of the reasons for which it has come to be treated in this way. Other timbers will behave differently, both immediately, and over time. The development of the process which is currently termed Sho Sugi Ban developed over a long period of time before it crystalised in the semi “standard procedure” known to us. What is most extraordinary is that a particular instance of the historical anthropology of technology is undergoing a mini renaissance care of this site! Your job is to apply the hearsay (read if you will – folk knowledge) that you have encountered, mix it with you own nous, and make us all beneficiaries of the result. Go to it! There are many ways in which the deployment of products available to us could fix or further certain aspects of the traditional process. It all depends, as did the original concatenation, on your ingenuity. Let us know the results! You have not even you good name to lose! Has anyone used the traditional technique and found that the charred timber needs oiling after a number of years. I am going to use this technique for some external cladding and would prefer not to be scrubbing and oiling and loosing the original quality of the material. Can we get an update on how the Wabi House is lasting or being maintained please. Has anyone used the traditional technique and found that the charred timber needs oiling after a number of years? I want to used the traditional sugi board for external cladding, but don’t want to loose the original quality of the char with scrubbing and oiling the wood? Also is there going to be an update of the Wabi House and how it is lasting or being maintained? This post is very inspirational. I am a garden designer and this has given me (in theory) an idea for modern garden I am currently doing. Anything but the dreaded sun bleached fence panel!! Has anyone had success with rough cedar? I’m thinking of using the process on timber posts, and they only come rough. Guess I could sand it first if necessary.I know experimenting is key, but with the price of timbers …. Hi, if rough is simply rough sawn, go for it. The burn will take you down and planing it all up would be a waste of time. But consider. Cedar is fine as it is, and both cryptomeria and cedar burnt will within 3 years weather down to grey unless you stain and maintain. Burning cryptomaria traditionally had a purpose, which was to enhance anti rot and insect properties, and to physically process it from rough to smooth. The contemporary equivalent of the tradition is thermowood. 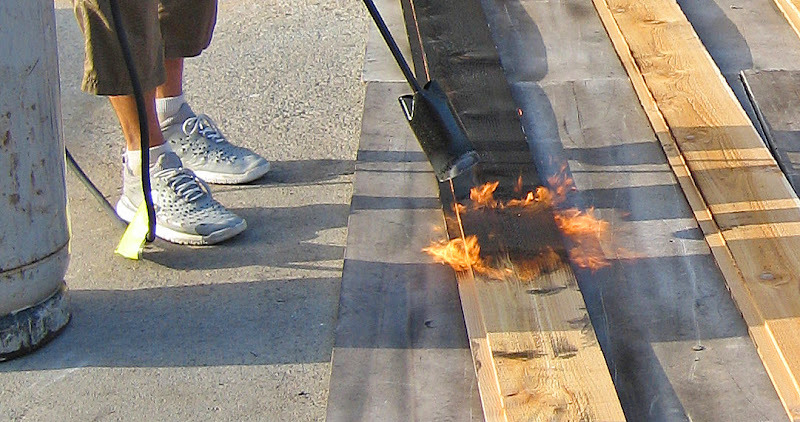 Burning other timbers is largely aesthetic, and to preserve this result against UV, you will initiate a maintenance schedule that the traditional process sought to render unnecessary. NB Get a few bits of cedar and EXPERIMENT first. David, I really love that you reply to this thread. I read every single one of your replies and all the posts of course, it’s very interesting. I came here after some research on Fujimori and Dwell (which, as usual in all of their articles, is quite shallow on the matter – Habitus Living, for example, would have written such a more interesting article). This brings me to my main question: do you think that this technique is workable on teack? I’m about to buy 120 tiles of 19″ x 19″ of teack from arb-teack.com (they’re mounted on an x frame and composed of 1″ x 19″ small sticks spaced at 5/8″). The person who sold it to me insisted that it should not be treated in ANY WAY: no sealant, no clear, no staining, nothing. He says that as soon as you make that mistake, you’re doomed into yearly and costly maintenance. His solution: let it become gray, and when you want the original look, just brush it and it’ll come back as new. If your answer to my question is yes, I would ask if you think that charring teack is a waste, considering the very high price of that wood and the fact that it doesn’t rot. I don’t trust the “don’t apply anything to it” because only one guy seems to insist that it’s the way to go, nor do I trust the “apply something”, as I have a teack table that was treated and it’s now a mess. But I trust the traditional shou-sugi-ban technique to protect the wood! I do hesitate to purchase teack – should I maybe just buy cheaper western wood for the deck’s floor and apply that technique to it? Finally: will the black finish keep its great look if I apply nothing, not even brushing after charring, or will it have to be redone in a few years? I too would be tempted to leave Teak alone. But for confirmation, talk to a local boatbilder. Teak is used for ‘decking’ in the most acerbic environment. They will know the procedure. I recently repaired a piece 20 years old that supports an outboard motor. The only rot was to the end-grain where contact prevented it drying. Teak seems an exotic choice in your catchment. What about larch? it has good longevity. Both are physically heavy (whereas Cryptomaria is a terrifyingly light timber, like balsawood). But you will end up with Balmoral quality. Most timbers will weather to grey within a couple of years unless otherwise maintained. There’s nothing wrong with maintenance, a stitch in time… The core of the question here is aesthetic vs practical. Practically, you chose timber and construction technique to maximise longevity and minimise necessary maintenance. if you want it to look like something particular in addition to this, the territory is decoration, and re-decoration, if you are up for it. The good thing about planning in ageing is the displacement of the temptation to keep everything looking like new. I dont know how Teak chars, except that I’ve an intimation that it will do so with a very expensive smell. Experiment. The burning process works with Cryptomeria because of specific qualities of the wood. The reaction seems to make the wood oily. Teal is naturally oily. If you burn this off you wont be doing the timber any favours. Also it will be walked on, and it will need periodic scrubbing against dirt & mould spores. You will rapidly scrub away all effects of the scorching, and it will wear differentially according to footfall anyway. The Fujimori piece was a costume jewel, raku for a building, a statement of controlled excess aiming a maximum visual impact rather than use. Your project is practical, you have some of the worlds best material, I’d let it modestly do its own thing – untreated. I’m pretty had clicked the “notify me of follow-up” but didn’t get an email when you replied. I just saw your message now by visiting your site again. Thank you so much for taking the time. What happened is I used teak on the deck and it’s superb. I will let it age naturally, without any treatment. But I haven’t ruled out shou-sugi-ban! In fact, I’m experenting now (yesterday and today) for the balustrade. Since the deck is pretty high up, we need a protective balustrade and for it I’m using eastern cedar. I have charred it using a torch and the look is SUPERB. Today we applied penofin for cedar, as suggested in your article. It hasn’t dried yet but after 4-5 hours I can say that it added a bit of red to the wood and it’s wonderful. I’ve experimented with two techniques: brushing a lot and brushing slightly. The first brushing is with an abrasive brush, the second one with a milder one. Now the big question is: am I the first to use shou-sugi-ban on a balustrade that will also serve as the back of where people will sit? I think that charring wood was intended for house sidings, not actual contact with clothes and people! So like you were suggesting, I’m experimenting: so far the “heavy brushing” piece of wood with added oil doesn’t stain too much, but it still stains. I’m waiting for it to dry completely (penofin takes three days in the sun to dry from what I’ve been told, and it better not rain on it…). I’m wondering what’s your opinion: the piece your are showing at the last step of the procedure doesn’t look like it would stain cloth or your hands. Can you confirm this? I’m pretty sure I had clicked the “notify me of follow-up” but didn’t get an email when you replied. I just saw your message now by visiting your site again. Hi, after a few months of exposure the wind and rain had accommodated everything you wouldn’t want on your cloths, which is how I guess the original process works in the backstreets of Kyoto, or where-ever. Its great, beautiful, isn’t it? It is indeed. I’ve never seen any project posted online (on Pinterest, Dwell, etc.) where the charred wood is close to where people sit or walk. Usually it’s on walls and rarely touched places. I just checked again tonight and the heavily brushed piece of wood seems to stain less than earlier today, probably because the Penofin has dried and created a small coating. I’ll clean it with those magic brushes that clean walls inside your home and see if I can reduce it even more. But so far so good and like you write, after a few months it’ll be great. Now let’s see if this passes the test of our harsh winters here in Canada! I’ll post the final results on my blog soon. (I double posted by mistake, please delete the first one as there’s a typo in it hehe). I applied the Penofin and it’s magic: the wood doesn’t stain at all. We’ll install it on aluminum beams (vertical beams) in the coming weeks. The one thing I noted though is that Penofin removes the brilliant shine that the soot was creating on the wood and that was absolutely beautiful. Maybe it’ll come back once the oil is fully absorbed. I am an architect, based in Sydney Australia looking to use the Shou Sugi ban charred timber cladding technique for part of the external façade on a building I am designing. I think Cryptomeria is hard to come by here so I was thinking of using either Western Red Cedar or Douglas Fir and a natural Penofin Verde or OSMO UV Protective clear oil finish like discussed above. Does anyone know of any suppliers or contractors that have already done this or that would do this in Australia? I’m finding it very hard to get technical information for the specification. Greetings from the sea. exactly the blog I’ll be back for more. thank you ken for the post, really looking good! , however, i am looking at using it for decking as well…. has anybody got experience with that? what should one seal the wood with in order to make sure no residue is being carried across areas? 60 days, and the other celebration must be given official notice or waive that requirement in an affidavit. internet people, who arre ishing for blogging. Can this shou sugi-ban technique be used on already painted cedar. It is a garden shed with a solid stain on it. The color is cream. Thanks for your input.